First Graduation In The Village – Elisha C.
You would have to be there yourself to fully appreciate it. Everyone left the room having either been brought to tears or experienced a sense of awe at the significance of this day. You don’t have heart-felt moments like this every day, and when it happens it sticks with you forever. It is hard to fully comprehend the fact that the village of Fond Doux and all the children have never experienced a graduation ceremony before… not one! Only a few years ago, I had not just one, but three graduation commencements to mark my accomplishments of finishing UCLA with a double major. Before that, I remember my high-school, middle-school, and even my kindergarten graduation! I have been blessed with many markers in my life to celebrate the seasons of hard work and launch me forward to the next season with great motivation. 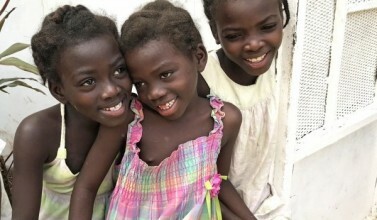 But most students in Haiti have never had these moments in their lives. These are young people with great dreams and visions. We are privileged to take part in their story and help them reach their destiny. Johnson Raymond is a 26-year-old graduating high school. At this age, he should be graduating with a masters degree according to US standards. But there were many years that he couldn’t attend school because his family did not have sufficient funds to send him. He never gave up. His mom, a strong woman who has endured many hard battles to give her children opportunities she never had, was sitting in the audience trying not to let all her emotions burst forth. This day was as much a celebration of this single mom’s commitment to her children as it was the hard work of a student. Emmanuel Alexander is a 29-year-old graduating high school. Only a few days before the graduation, he had a scare. Like many other 13th graders each year, the government failed to issue him his papers to grant him permission to take his final high school exit exam. His principle personally went to the capital, Port-au-Prince to fight for him. In the morning of the first exam, Emmanual was one of the few who received his papers. After a week-long exam, he had the opportunity to walk down the aisle as the graduation song was playing. He does not have his biological parents to support him, but for the commencement he invited Hibert, a respected elder in the village, as his father to celebrate with him. I can only imagine the overwhelming sense of joy behind that big smile. He had made it! We can’t help but face the fact that many young Haitians did not have the same happy ending that day. After all their hard work and anticipation of finally finishing high school, they are hit with the reality that they have to wait yet another year. There is nothing else they can do. And many people give up there…the real-life struggles of being stuck in the system of a third-world country. But on commencement day, we had to push forward and focus on celebrating the ones who had made it. And what a celebration it was! It is a day we will never forget. Many children were peeking in, witnessing a graduation for the first time. They are being inspired to never give up no matter how difficult or how long it will take. “One day that will be me,” one of our other students declared. So what’s next for these graduates? This is not the end, but only the beginning. Johnson, our student speaker brought us to tears with this, “We, the graduates today, we know it’s not over yet. The population, all of the kids, they are watching us, we are their models. Whatever we do, whatever is good, they will want to do it. Now my mission is to set a great example for the others that are coming.” Our hope is that they will become great leaders for their country. Whether they find an influential job or have the chance to pursue higher education, we trust that they will take what we’ve sown into their lives to help others around them. They still have a whole life ahead of them. But we were able to pause for a moment in time to recognize the struggles that the students and their families have overcome, to celebrate their victories and to launch them forward to their next season. We will see the ripple effects not only in their lives but also in the lives of the younger generations to come.